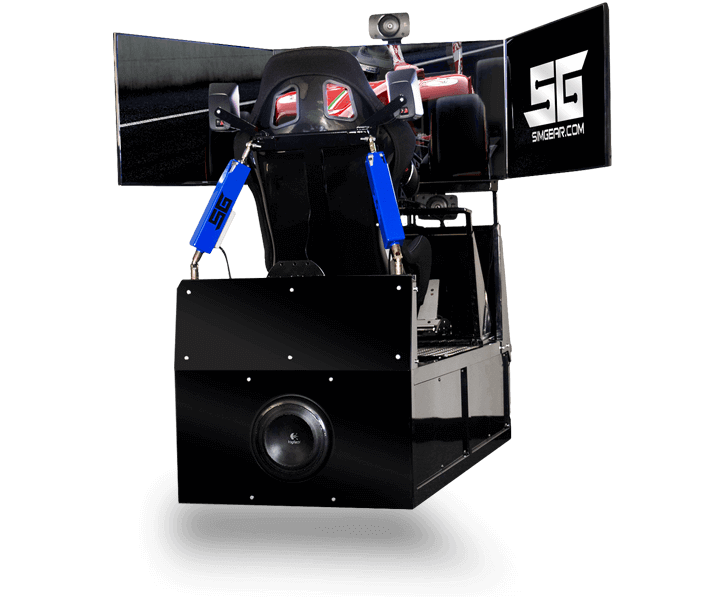 SimGear GT Series Racing Rigs were designed with mobility in mind. Simulators are notoriously large and cumbersome to relocate. Our design incorporates all components within the chassis and includes the monitors as well. 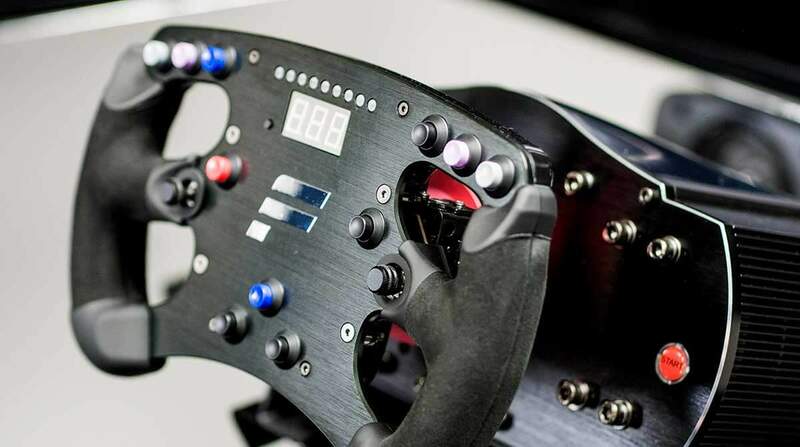 The SimGear simulators utilize an immersive 2 DoF setup running SCN5 actuators and are finished in a strong protective and sharp looking black powder coat. Optimizations are done to ensure all titles run at their best performance and all controls are pre-configured. Strap in and start racing! Internal wheels are easily deployed with a crank, monitors fold in and the maximum width of the simulator is just 29”. Move in and out of most any doorway in the world. SCN5 actuators for fast speeds and high load capacities. The angle the actuators are mounted on give it the same trajectory it would have as if the rig was 36” wide, allowing maximum movement from the actuators giving up no range of motion. Pedals, wheel, monitors and seat adjust independently. Peripherals can be added at any time with a simple hand screw; add flight controls, shifters, etc. Ultimate immersion with Oculus Rift for virtual reality racing! Rift’s advanced technology combined with its precise, low-latency tracking system enables the sensation of presence. Crated and shipped, or delivered by courier. Ship anywhere in the world! The setup is a simple as plugging in the unit and powering it on! White glove delivery and training available. I purchased a SimGear simulator for my son Aidan to get valuable seat time. The simulator has become a great training tool especially with the release of the iRacing Dirt update. Aidan who is still in his early teens, attributes a lot of his success to his training on SimGear. The SimGear simulator has become a valuable tool for our team and drivers. We run sessions on the simulator before every away race we participate in and it has helped give us an edge that is impossible without actual practice at the track. Nothing compares to a motion simulator. One wasn't enough, so I purchased two so my buddies and I can race head to head.